I am fortunate to own an E34 M5. How I became its owner is an unfortunate event. 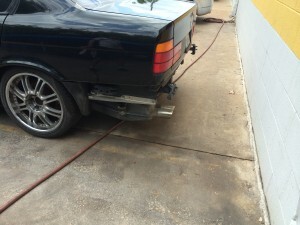 For over 12 years I’ve used three different mechanics in the Dallas area that specialize in Porsche and BMW. Each has their strengths and weaknesses. 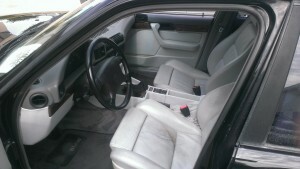 out the passenger front window so they could quickly remove the car’s mirrors, shift surround, and stick shift knob. Then they jacked up the car to steal its offset throwing star rims and remove both bumpers in their entirety. Why they didn’t remove the highly sought after Motorsport branded front door handles is anyone’s guess. Still, the damage was done and the car was left sitting on its brake rotors. From what I am told, it was left this way for over a year while the owner tried to source parts with little avail. It was a sad and unfortunate event. In the summer of 2014 I got the call I call from the mechanics indicating the owner was ready to sell it. Shortly thereafter, we agreed upon a fair price and I became the car’s new owner. As the tagline in this site indicates, there is a responsibility that comes with owning an E34 M5 and this car’s problems were now mine. Beyond the stolen parts, the car had a number of interior and exterior aesthetic problems. Though I’m not sure exactly how these problems developed, I assume that sitting outside with a broken window did not help. Still, I was encouraged by the project as the car did come with a 10 year maintenance history that totaled over $22K in the right kinds of repairs from mechanics I knew and trusted. I was in a unique situation with this car as I happened to be the original owner of a 1995 E34 525i which had some great tweaks that were applicable to my newly acquired M5. 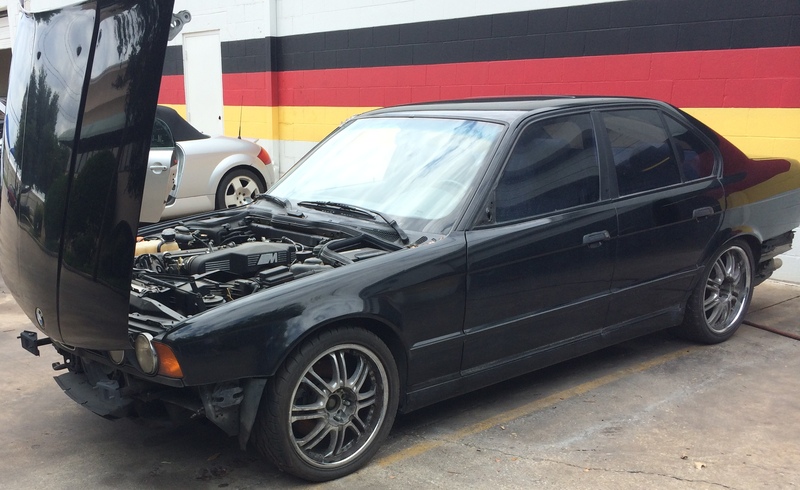 These parts included a 525i front bumper with a modified DMT lip spoiler, a racing dynamics strut tower brace, a beautiful Billy Boat exhaust system, M5 M-Sport mirrors, and all of the windows, accumulators, lights, molding a restoration project could need. Most importantly I had both a set of 17″ M5 turbine wheels and a set of M5 offset throwing star wheels. In August of this year, I parted my 525i and had one of my trusted mechanics begin this restoration.